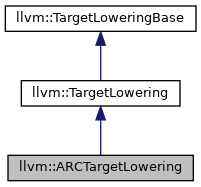 Definition at line 60 of file ARCISelLowering.h. Definition at line 72 of file ARCISelLowering.cpp. 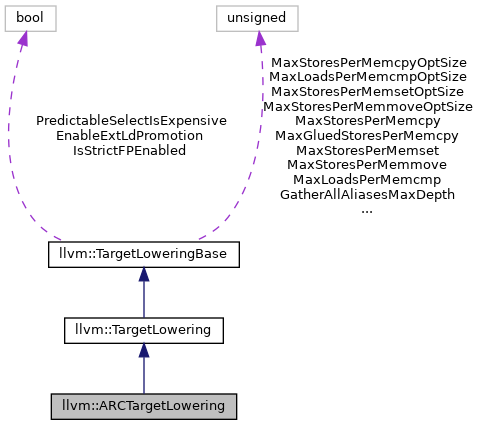 References llvm::ISD::ADD, llvm::TargetLoweringBase::addRegisterClass(), llvm::ISD::AND, llvm::ISD::BR_CC, llvm::ISD::BR_JT, llvm::ISD::BRCOND, llvm::ISD::BUILTIN_OP_END, llvm::TargetLoweringBase::computeRegisterProperties(), llvm::ISD::Constant, llvm::TargetLoweringBase::Custom, llvm::TargetLoweringBase::Expand, llvm::ISD::FRAMEADDR, llvm::ARCSubtarget::getRegisterInfo(), llvm::ISD::GlobalAddress, llvm::MVT::i1, llvm::MVT::i32, llvm::ISD::JumpTable, llvm::TargetLoweringBase::Legal, llvm::ISD::LOAD, llvm::ISD::MUL, llvm::ISD::MULHS, llvm::ISD::MULHU, llvm::MVT::Other, llvm::ISD::ROTR, llvm::ISD::SELECT_CC, llvm::TargetLoweringBase::setBooleanContents(), llvm::TargetLoweringBase::setBooleanVectorContents(), llvm::TargetLoweringBase::setOperationAction(), llvm::TargetLoweringBase::setSchedulingPreference(), llvm::TargetLoweringBase::setStackPointerRegisterToSaveRestore(), llvm::ISD::SHL, llvm::ISD::SIGN_EXTEND_INREG, llvm::ISD::SMAX, llvm::ISD::SMIN, llvm::Sched::Source, llvm::ISD::SRA, llvm::ISD::SRL, llvm::ISD::STACKRESTORE, llvm::ISD::STACKSAVE, llvm::ISD::STORE, llvm::ISD::SUB, llvm::ISD::UNDEF, llvm::ISD::VAARG, llvm::ISD::VACOPY, llvm::ISD::VAEND, llvm::ISD::VASTART, and llvm::TargetLoweringBase::ZeroOrOneBooleanContent. Definition at line 141 of file ARCISelLowering.cpp. References llvm::ISD::ADD, llvm::CCValAssign::AExt, llvm::CCState::AllocateStack(), llvm::CCState::AnalyzeCallOperands(), llvm::ISD::ANY_EXTEND, Arg, assert(), llvm::ARCISD::BL, llvm::ARCISD::BRcc, llvm::TargetLowering::CallLoweringInfo::CallConv, Callee, llvm::TargetLowering::CallLoweringInfo::Callee, llvm::TargetLowering::CallLoweringInfo::Chain, llvm::ARCISD::CMOV, llvm::ARCISD::CMP, llvm::TargetLowering::CallLoweringInfo::DAG, llvm::TargetLowering::CallLoweringInfo::DL, E, llvm::SmallVectorBase::empty(), first, llvm::CCValAssign::Full, G, llvm::ARCISD::GAWRAPPER, llvm::TargetRegisterInfo::getCallPreservedMask(), llvm::SelectionDAG::getCALLSEQ_END(), llvm::SelectionDAG::getCALLSEQ_START(), llvm::SelectionDAG::getConstant(), llvm::SelectionDAG::getContext(), llvm::SelectionDAG::getCopyFromReg(), llvm::SelectionDAG::getCopyToReg(), llvm::SelectionDAG::getDataLayout(), llvm::SelectionDAG::getIntPtrConstant(), llvm::CCValAssign::getLocInfo(), llvm::CCValAssign::getLocMemOffset(), llvm::CCValAssign::getLocReg(), llvm::CCValAssign::getLocVT(), llvm::SelectionDAG::getMachineFunction(), llvm::SDValue::getNode(), llvm::SelectionDAG::getNode(), llvm::SDValue::getOperand(), llvm::TargetLoweringBase::getPointerTy(), llvm::SelectionDAG::getRegister(), llvm::ARCSubtarget::getRegisterInfo(), llvm::SelectionDAG::getRegisterMask(), llvm::SelectionDAG::getStore(), llvm::SelectionDAG::getTargetExternalSymbol(), llvm::SelectionDAG::getTargetGlobalAddress(), llvm::SelectionDAG::getTargetJumpTable(), llvm::SDValue::getValue(), llvm::SDValue::getValueType(), llvm::SelectionDAG::getVTList(), llvm::MVT::Glue, llvm::MVT::i32, llvm::MipsISD::Ins, llvm::TargetLowering::CallLoweringInfo::Ins, ISDCCtoARCCC(), llvm::CCValAssign::isMemLoc(), llvm::CCValAssign::isRegLoc(), llvm::TargetLowering::CallLoweringInfo::IsTailCall, llvm::TargetLowering::CallLoweringInfo::IsVarArg, llvm::ARCISD::JL, llvm_unreachable, lowerCallResult(), llvm::AArch64CC::LS, llvm::BitmaskEnumDetail::Mask(), N, llvm::MVT::Other, llvm::TargetLowering::CallLoweringInfo::Outs, llvm::TargetLowering::CallLoweringInfo::OutVals, llvm::SmallVectorTemplateBase< T >::push_back(), llvm::ARCISD::RET, second, llvm::CCValAssign::SExt, llvm::ISD::SHL, llvm::ISD::SIGN_EXTEND, llvm::SmallVectorBase::size(), llvm::ISD::SRA, llvm::SPII::Store, llvm::ISD::TokenFactor, TRI, llvm::ISD::ZERO_EXTEND, and llvm::CCValAssign::ZExt. Return true if the addressing mode represented by AM is legal for this target, for a load/store of the specified type. Definition at line 697 of file ARCISelLowering.cpp. References assert(), llvm::ARCISD::GAWRAPPER, llvm::SelectionDAG::getCopyFromReg(), llvm::SelectionDAG::getEntryNode(), llvm::MachineFunction::getFrameInfo(), llvm::ARCRegisterInfo::getFrameRegister(), llvm::GlobalAddressSDNode::getGlobal(), llvm::SelectionDAG::getMachineFunction(), llvm::SelectionDAG::getNode(), llvm::GlobalAddressSDNode::getOffset(), llvm::SDValue::getOperand(), llvm::SelectionDAG::getTargetGlobalAddress(), llvm::SDValue::getValueType(), llvm::MVT::i32, llvm::TargetLoweringBase::AddrMode::Scale, and llvm::MachineFrameInfo::setFrameAddressIsTaken(). Provide custom lowering hooks for some operations. Definition at line 747 of file ARCISelLowering.cpp. References llvm::ISD::BR_CC, llvm::ISD::FRAMEADDR, llvm::SDValue::getOpcode(), llvm::ISD::GlobalAddress, llvm::ISD::JumpTable, llvm_unreachable, LowerVASTART(), llvm::ISD::SELECT_CC, llvm::ISD::SIGN_EXTEND_INREG, and llvm::ISD::VASTART.